Socket 1156 burning issues...is the fire out? Several months ago, there was some news worthy mentions from many sites about the Foxconn made sockets for the P55 (Socket 1156) platform including Anandtech’s article. 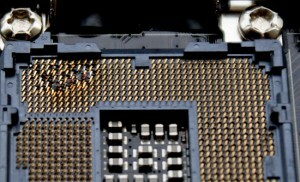 When the issue was in its prime, one would see many forum users suggesting others to stay away from motherboard “X” because it has a Foxconn socket and could burn up. Looking back, was this type of response warranted? Did Foxconn or even Lotes sockets all over the world melt or char CPU’s at an alarming rate? Lets see what time has told us. The short answer to these questions are a resounding, NO!! I took the time to search Anandtech, EOCF, Tom’s, XS, TPU, and of course Overclockers.com forums to see if this issue has propagated past the initial few sockets that “went up in flames,” and I could not find anything much past November of last year. However, in asking some extreme over clockers here if they have seen the issue, a siting or two has occurred in their world here and there, again under extreme conditions and voltages. In our previous article outlining this reported issue, the pressing question for most who read this still needs answered. What about the normal overclockers out there? You know, the ones not crazy enough to go subzero, those under water and air using sane voltages and 24/7 overclocks? Has this problem hit that group as well? Again, we find the answer to be a seemingly conclusive NO…at least not at this time. In a couple of years something may come up, but only time will tell. At that point, most here would move on to or already be on a new platform anyway. I am personally on this socket and through a couple cracks at a foxconn socket motherboard under extreme conditions it didn’t happen, but then again, I’m not breaking any world records and not REALLY pushing the envelope like others do on this cooling and I only have a minuscule data set to refer to. Running 4GHz 24/7 (up to 4.6GHz benching on water) plus my short subzero adventure, there were no signs of it happening as all the pads on the CPU and connections in the socket were clean and making good contact. As a side note, since the initial article was created, a new set of motherboards were released (H55/H57 chipsets) with both Lotes and Foxconn sockets, and there havent been any issues, that I could find, on that platform either. Wasn't this issue based on the type of VRM the mobo makers used and how it wasn't up to snuff with intel's requirements? Anything is possible, but I cant say with the research I did I ever heard of that being a potential cause. In the previous article some theorized that there were less pins with the same/more voltage and that could cause it. And still others said it was deeper in the socket...a feedback issue. If that has anything to do with the VRM's, then it could be. Not that I've read, but it could be... Got any sources on that? As far as I've seen personally, no one had a conclusive/authoritative explanation for what was happening. How many actual, confirmed cases of this were there? In any event, this is the kind of article I love to see: a follow-up for self*-assessment of past reporting. It's quality control for the field, and I absolutely want to see more of it! *self: = the overall computer hardware reporting community, not of EarthDog or oveclockers.com in particular. I dont think I can quantify that accurately with such a small sample.. from what I have seen, between 5-10. Im sure its a lot more than that, but, thats what I recall seeing. I'm also thinking that most of the cases of this happening were right after the 1156 platform became available and that maybe some of the initial run of sockets by Foxconn were kind of iffy. I actually seem to remember that there were a small number of Foxconn supplied sockets that were found to need a revision to them that actually got into the supply channel too.